Tabular alumina balls are sintered alpha alumina with very high-purity, high-density, fully shrunk, coarse crystalline alpha aluminas. When the internal crystalline structure of tabular alumina is examined, large plate-like or tablet-like crystals are apparent. The shape of these crystals gives "tabular" alumina its name. Tabular alumina is produced by sintering ball-formed calcined alumina at a very high temperatures around 2040°C (3704°F), which is the fusion point of aluminium oxide. The alumina is formed from pure aluminum oxide. Practically all porosity and shrinkage is removed under such high temperature. Essentially tabular alumina is 100 percent alpha alumina (corundum). 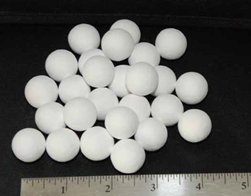 These tabular alumina balls are then crushed, graded or screened, and ground to a wide range of granular or powdered particle-size distributions. Tabular Alumina can appear as white crystalline granules or powder. Depending on requirements, ball sizes are produced from 1/8 to 1 inch (tolerance ± 1 mm). Tabular alumina balls are long lasting, smooth, high chemical purity, resistant to thermal shock, and resistant to the mechanical and abrasive actions found in catalyst support systems. Additionally, tabular alumina balls do not produce fines and dust to contaminate the product stream, and are unaffected by oxidizing and reducing atmospheres at temperatures well below the softening point. Contact KT Refractories for Tabular Alumina, Tabular Alumina Balls, or other refractory raw material because we save you time and money! Other sizes available per customer's requirement.